In China's big cities like Shanghai, it's easy to spot motorcyclists. What few that there are stand out as they weave through streets near subway stations offering illegal taxi services, while others simply seem content to turn passers-by green with envy with their retro-style sidecar-equipped motorcycles favored mostly by expats or purring Harley-Davidsons. Their rarity is due in part to local government policies, which have either banned motorcycles or diminished their numbers because of safety and air-quality concerns. Another reason, however, is the stiff competition they face, and not just from the trusty bicycles for which China is renowned or the growing number of automobiles clogging the streets. Electric bikes, or e-bikes, are pouring on to China's bicycle lanes and streets. While bicycle ownership in China is much higher, at 470 million, there's no denying the popularity of e-bikes, whose numbers have been growing steadily and now total 120 million. Annual e-bike sales jumped from 1.5 million in 2002 to four million in 2003, and recently hit 25.2 million a year. But e-bikes may now be at a crossroad. Just like a host of other local industries, it's a highly fragmented, and thus inefficient, industry. It's also struggling to increase demand in new markets outside China, making it overly dependent on domestic sales — 29.5 million e-bikes were manufactured in the country in 2010, of which 585,000 were for export, according to the China Bicycle Association (CBA), and Electric Bike Worldwide Reports (EBWR) says that of the roughly 29 million e-bikes sold worldwide, the U.S. and Europe accounted for only 80,000 and 1.02 million, respectively. Up to now, one barrier after another has fallen in China to spur the industry's growth. In 1996, for example, Shanghai banned the use of gasoline-powered scooters. The internal combustion engine motorcycles seen in Shanghai today run on either liquefied petroleum gas (which are legal but their number is restricted) or a few are gasoline-powered motorcycles that have license plates from outside Shanghai. With the car prices still out of reach for many, e-bikes have become the Cadillacs of the working class. Equipped with removable batteries that can be charged easily at home or in the office, e-bikes are more like scooters and are classified as non-motor vehicles so they're exempt from the motorcycle restrictions in force in a number of cities. There's also a plethora of e-bike companies vying for their business. China boasts more than 2,600 e-bike companies, most of whom simply assemble the kits that they have bought from other manufacturers. Only around60 are actual manufacturers. For that reason, Ed Benjamin, managing director of Florida-based eCycleElectric Consultants, says some M&A activity has begun over the past few years and he foresees that gaining momentum. "I think this will continue until there are two or three large companies per province and a handful of small players, notes Benjamin, a 30-year veteran of the U.S. bicycle industry. Others are less optimistic. “The current industry is so fragmented and so many companies will continue [entering it],” asserts Masatoshi Kojima, professor of business administration at Toyo University in Tokyo, who is also a research fellow at Toyo University’s Research Center for Creative Management. “The key to changing this will be if Chinese consumers become more aware of the need for better-quality goods, including e-bikes,” raising the barrier to entry. As far as most e-bike companies in China are concerned, there's little incentive to change. With few foreign manufacturers competing against them in the country's e-bike market, it's easier — and more profitable, at least over the short term — to maintain the status quo. The Taiwanese are not the only strong foreign presence in China. Accell Group and Gazelle, the larger and older brands in Europe, are importing e-bike parts from China. 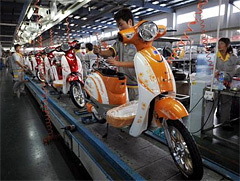 Meanwhile, Japanese firms such as Yamaha Motor or Honda Motor have joint ventures in China make high-quality e-bikes, largely for their home market, where scooters are as popular as they are China. An important consideration is that e-bikes sold in China today have been designed for relatively short journeys and light loads rather than for rougher countryside conditions. Given a choice between gasoline-powered motorcycles and an e-bike, Benjamin says he knows which one a farmer would pick. “If a farmer wants to carry his pig to the market in rural areas, an e-bike is not as useful a tool as a gasoline motorcycle,” he notes. Outside cities, “trips are longer, speed limits are [higher], roads are rougher and e-bikes are less suitable," Cherry says. "I've been waiting for Chinese companies to come out with a really robust competitor to the low-cost Chinese motorcycle to compete in China and abroad. I've not seen much in that area yet." But Li Zejian, a project research associate at Tokyo University's Manufacturing Management Research Center, says he is noticing more e-bikes in both the outskirts of cities and the countryside in China. The affordability of e-bikes is one of the big attractions. A gasoline-powered motorcycle costs from between RMB 5,000 and RMB 8,000 (US$788 and US$1,261), compared with a price tag of between RMB 1,500 and RMB 3,000 for an e-bike. What's more, some e-bikes can also cover reasonably long distance. “I was surprised to see that some e-bikes have a range of more than 100 kilometers on a single charge. Can you imagine? It means those e-bikes are powerful enough to even travel [the 100 kilometers] from Shanghai to Suzhou,” says Li. Yet it may be environmental and safety concerns rather than travel needs that lead the e-bike industry to retool products. In China and elsewhere, consumers are realizing that despite their relative energy efficiency and absence of direct carbon emissions, e-bikes are not as green as often thought. According to the CBA, 97.5% of the e-bikes produced every year in China use lead-acid batteries instead of less polluting lithium ion batteries. The former have been responsible for a rash of lead poisoning cases, and earlier this year, authorities cracked down on heavily polluting factories making them. However, given the near universal reliance on lead-acid batteries, quick changes aren't likely. Lithium ion batteries are much lighter and last longer, but they are some 2.5 times more expensive than lead-acid batteries. Yet measured by average cost per kilometer traveled, the cost is, in fact, not much higher than lead, so the problem is actually one of overcoming the “sticker shock,” says Cherry. Often not as noisy as other vehicles and traveling unexpectedly fast, e-bikes can be dangerous. The death toll from accidents involving such two-wheelers reached more than 3,600 in 2009, compared with 2,500 in 2007. Regulations introduced in 1998 requiring e-bikes to weigh less than 40 kilos (88 pounds) and travel no faster than 20 kilometers per hour, but many on the road today are much heavier and faster than that. Neither manufacturers nor retailers are willing to heed the rules. E-cyclists are equally complicit. “The ‘bigger/faster’ trend has been somewhat alarming, considering there are no requirements for licensing, age, insurance [and the like] for these things. And they still operate freely in bike lanes, sidewalks and so on,” says Cherry. In a research paper on China's transition to e-bikes and its effect on travel, he recommended that the country require licenses for e-bikes to improve safety and control over the number of e-cyclists. Central government efforts to address the issue have been met with local government resistance. China’s Standardization Administration drafted new standards for e-bikes in 2009 stipulating that electric two-wheelers weighing more than 40 kilos and capable of travelling faster than 20 kilometers per hour be treated as motor vehicles, with mandatory insurance and driver's licenses and prohibited from bike lines. But the administration backed down when objections were raised that the standards would force hundreds of e-bike factories to close and unfairly penalize millions of e-cyclists. That may not be the last of the debate, however. “I do not believe that the government will phase out electric bikes since they are so popular in China,” predicts Frank Jamerson, publisher of EBWR in Michigan who retired from General Motors’s electric vehicle project in 1993. "They will have more regulation to enhance safety and performance." According to Cherry, the situation is a reflection of the general tension between the central and local governments. “At the end of the day, it will likely be a city-by-city policy decision, which makes it hard to tell where changes will occur,” he says. China’s eBike market is one of those things that is often quoted in the West but with little real understanding of it’s realities. As this article points out, almost all eBikes in China use Lead Acid batteries that are terrible for the environment both because of the way they are made and because they are normally not disposed of properly. Luckily in Europe we have legislation that prevents this, so companies such as Fully Chargedonly stock bikes with Lithium Batteries. This does mean the bikes are more expensive but what’s the point of “green” solutions that end up being worse for the environment? Clearly though this has had an effect on the rate of take up of eBikes in Europe and the US however with the advent of Sodium Ion technology that promises to be as efficient as Lithium but markedly cheaper, that might well change.